Today was scheduled to be the grand finale of Revision Week, but the event has been so fun that The Editor can’t resist posting a bonus author interview tomorrow. Stop by for that surprise guest, along with a bonus edit giveaway. 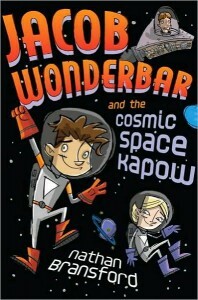 For today, we’ve got the wonderful Nathan Bransford, author of the Jacob Wonderbar middle grade series and former literary agent with Curtis Brown. Nathan offers a unique view of the revision process thanks to his experience both as an author and as an agent ushering writers to book deals with publishers. We’ve also got the promised “FREE Full Manuscript Edit” Giveaway from The Editor! 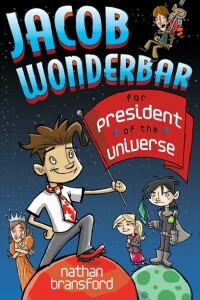 Nathan Bransford is the author of Jacob Wonderbar and the Cosmic Space Kapow and Jacob Wonderbar for President of the Universe, the first two novels in a middle grade series about three kids and their planet-hopping adventures. 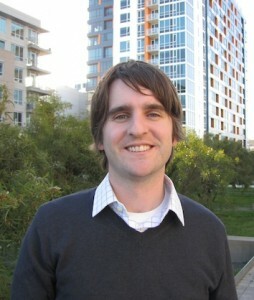 He was formerly a literary agent with Curtis Brown Ltd. from 2002 to 2010, but is now a social media director and the writer of the popular blog about writing and publishing, www.nathanbransford.com. *After Nathan’s interview are instructions for entering today’s Free Full Manuscript Edit Giveaway. How many drafts does it typically take before you feel confident about the character and story choices you’ve made? This is a tricky question for me actually because I tend to edit as I go and don’t typically go through discreet drafts. But the novel is usually done for me after the third or fourth major overhaul. Whatever draft it is where I can’t bear to look at it anymore and have exhausted every possible idea. It depends on the book, but usually two major rounds of revision. No, I don’t show it to anyone before I send it to my editor. I’m fortunate to have a really fantastic editor, Kate Harrison, who helps me mold the book into a much better form once I’ve gotten as far as I can go on my own. As an agent, did you ever work through revisions with authors before submitting them to publishers? Definitely, I was a very hands-on agent. I always thought it was important to make sure the manuscript was as good as possible before going out to editors. Do agents work through revisions with writers before agreeing to represent them? It depends on the agent. When I was an agent I preferred to work with authors on an exclusive basis but without an offer of representation in place. That way we could both see if we were happy with how the revision process was going and our working relationship and formalize the relationship once we were confident in the manuscript. But situations vary. What’s the most drastic revising experience you’ve been part of? When my editor says it’s done. Your manuscript must be COMPLETE and SHALL NOT EXCEED 90,000 WORDS. In the case of a picture book entry, the manuscript cannot exceed 7 double-spaced, 12-pt font pages. Deadline: MIDNIGHT tonight, March 10, 2012, PST. Winner will be randomly selected using Randomizer.org and announced on March 11, 2012, in the DearEditor.com comments section and on the DearEditor.com Facebook page, and the winner will be notified directly via email. One entry – SEND EMAIL to DearEditor.com using the “Write to The Editor” button at the top of the blog or by clicking here. Type “Free Full MS Edit Giveaway” in the subject line. In the body of the email, include the TITLE of your manuscript and YOUR FULL NAME. (If you have any difficulty with the contact button, send an email entry directly to dear-editor@hotmail.com.) Do not attach or embed any part of your manuscript in the entry. Extra bonus entries – SPREAD THE WORD. Blog, tweet, or otherwise electronically tell others about this Revision Week giveaway to get additional entries today. Send an email to DearEditor.com with “I Spread the Word!” in the subject line, and in the body include a link to your blog post or your Twitter address or your Facebook wall or whatever social media you used to spread the word. Don’t send screen-shots; attachments won’t be accepted. Include your title and full name in the body. Spread the word more than once? Then send an “I Spread the Word!” email for each one! Congratulations to yesterday’s Free Partial Manuscript Giveaway: Elaine Kearns! Elaine, I’ll send you an email directly. Everyone else: good luck with the full ms giveaway today!! Thank you , thank you, thank you so much! 😀 I am beyond excited! This was a fun week. I’m sure learning a lot. Lowering my anxiety about “perfectionism” alone is worth my undying gratitude. Thanks for this opportunity. Glad this will be an annual event now. I hope that’s true truth for both the partial and full edits too. Thanks again to all the guests who took time from their busy schedules to give the hope, knowledge, and tools shared this week. So glad to know how meaningful this week has been for you. Happy revising! Thank you for such a fun week. Every post was a gem. Nathan’s interview was terrific! I subscribe to three blogs: Bransford’s, MSFV, and DearEditor because those are the three best on the web! 😀 One thing that surprised me this week was that so many authors never use CPs. I love mine — as much for support as for the feedback. Thanks for an awesome interview, Nathan, and a great week, Deborah! Thank you Dear Editor, and all your wonderful guests, for a full week of helpful and informative posts! Wow, a bonus entry for us tomorrow? Thanks for this week. I hope you will do this again. Enjoyed the opportunity to learn more about other writers and our craft. Great interview, Nathan. You make it sound so easy hahaha!!! I love that Nathan says he had to rewrite his opening (sorry, Nathan!) because it helps to know that even someone with his years of experience finds opening tricky. I know I do! He’s been a incredible source of information and encouragement to so many writers through his great blog. The trailer on YouTube is great! Okay, I’m in! Better late than never, right? Great interview, by the way. I enjoyed reading it. Wow, two major rounds of revision after the editor has seen the draft? Sounds like a lot of work! Thanks for the heads-up! Thanks for a great week of posts! I’m revising right now, and they were so helpful!